The Occupy Wall Street (OWS) movement is thriving, spreading from New York City to hundreds of cities around the country and to the world. Its evolution is remarkable given initial disregard or criticism from corporate media, and demeaning characterizations by congressmen (“mobs”) and presidential contenders (“unpatriotic”). Initiated largely by young people, this vibrant movement resonates with people of all ages, political affiliations and virtually all socioeconomic classes — the “99 percent” of the U.S. population who are economically disenfranchised by the “1 percent” who control at least 40 percent of U.S. wealth, according to Nobel laureate and former World Bank chief economist Joseph Stiglitz. Like all new organisms, the OWS movement is in the throes of forming itself, with stops and starts along the way. Still, in a significant departure from most other U.S. cultural institutions, the movement has insisted on nonhierarchical (“horizontal”) decision-making or “consensus,” characteristic of some American Indians like the Navajo, as well as the Green Party of the United States, and on cooperation and nonviolence as the way 99 percent-ers would relate to others as they articulate their goals. Indeed, OWS opposes “corporate personhood” as a main source of economic inequity and corruption of democracy. 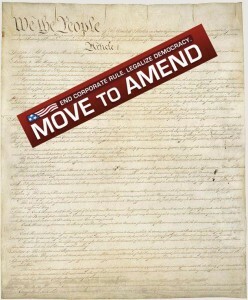 Addressing that very demand, “Move to Amend” was formed by a coalition of nonpartisan citizens and organizations in January 2010 in response to the Supreme Court decision, Citizens United vs. the FEC, which affirmed corporations as “legal persons” with first and 14th Amendment protections including speech, due process and equal protection. 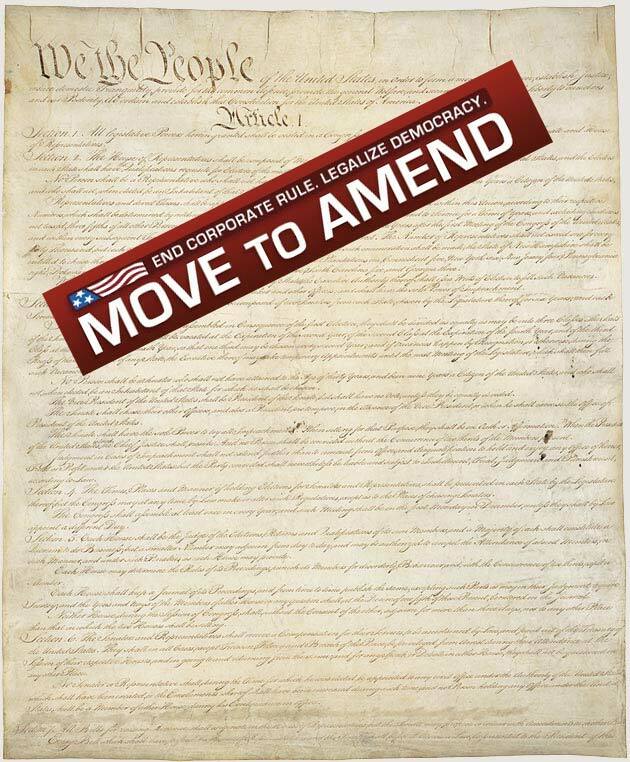 Like OWS, “Move to Amend” is ambitious in its aims, calling for a constitutional amendment to abolish “corporate personhood” and reestablish a government of, by and for human beings. Indeed, this movement sees granting personhood and human rights to corporations as a legal fiction masquerading as the truth. Recognizing that this will be an uphill battle, Move to Amend focuses on educating the public about the history of corporations especially from 1789 when the US Constitution took effect. It was procedurally difficult then for corporations to be chartered. They had to demonstrate that they met a public need not already being met, the charter was time-limited, and their functions were restricted to what they were chartered for — nothing more. If a corporation acted outside that specific function, or if it acted against the public good, the charter was revoked. As corporations came to be seen as “persons” with human rights beginning at the end of the 19th century, the possibility of constraining them even when they did act against the public good became increasingly difficult, to the point that through lobbyists and campaign contributions, corporations today virtually select and control our elected officials and the laws they make. Last year’s Citizens United Supreme Court ruling has made that access and control just much easier. Is it any wonder that the OWS movement has emerged and is growing? Surely it reflects the frustration, helplessness and even cynicism that vast numbers of U.S. voters feel with regard to their attempt to influence their government. But hope is alive and coming to Connecticut in an edifying feast on the subject by a Move to Amend founder and spokesperson, attorney David Cobb. He will be speaking in the state at several venues beginning Tuesday evening, Oct. 25, at the Dodd Center of the University of Connecticut, Storrs, and culminating in a talk on Oct. 29 at Kent Town Hall, Kent. Several groups are sponsoring this tour, including UConn Student Government, the Shoreline League of Democratic Women, MoveOn.org and the Green Party of CT.
As Americans including OWS, look for ways to address our huge socioeconomic disparities and the corruption of our democratic process, “Move to Amend” the Constitution offers a concrete path towards change. Justine McCabe is a psychologist in practice in New Milford and is the co-chair of the International Committee, Green Party of the United States.